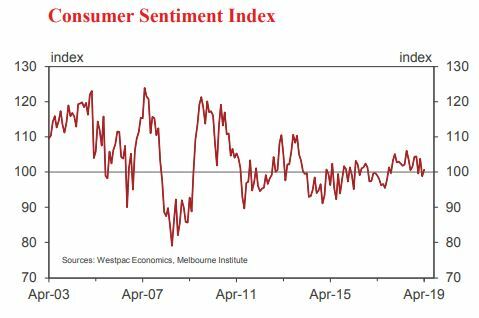 • The Westpac-Melbourne Institute Index of Consumer Sentiment rose 1.9% to 100.7 in April from 98.8 in March. The survey was conducted over the period April 1 to 5 and captures consumer reactions to the Federal Budget. While the month to month rise in sentiment is fairly muted, the survey detail suggests the Budget was well-received. Sentiment over the course of the week showed a clear boost, with sentiment amongst those surveyed post-Budget 7.7% higher than sentiment amongst those surveyed prebudget – the most positive turnaround since we began tracking pre and post Budget responses in 2011. The key issue will be whether this boost from the Budget is sustained. Certainly the ‘pre Budget’ print of 96.8 showed a further deterioration in sentiment from the previous print of 98.8, despite what was already quite a sharp 4.8% fall in March. Persistent weak wages growth; falling house prices; and the perceived rising cost of living are all weighing on consumers. This is best captured in the component of the Index – ‘family finances compared to a year ago’ – which declined 4.9% in April (showing little movement between pre and post Budget responses) and is down 9.6% on a year ago. That compares to the headline Index which is only down by 1.6% over the same period. The month’s survey included an additional question asking consumers about the impact they expect the Budget to have on their finances over the next 12 months. Responses again suggest the 2019 Budget was well-received. Around 15% of consumers expected it to improve their finances; 51% expected no change; and 22% expected it to worsen their finances. While the overall balance is negative, consumers appear to carry a consistent negative view around budget assessments. At –8.5% the net improve/worsen reading is less negative than last year’s net –10.4% and easily the ‘best’ response we have seen since we began running this question in 2010 (the average reading being –26.6%). Tax relief was again a key feature of this year’s Federal Budget with new measures building on the seven–year personal income tax plan announced last year. The main near term measures are clearly targeted at ‘low and middle income earners’. Accordingly it is no surprise that sentiment showed more positive responses amongst consumers in these income groups – both the post-Budget lift and assessed impact on family finances were markedly more positive amongst consumers with incomes in the $60–100k a year range. Other factors that may have impacted sentiment in April include: a continued lift in the ASX, now up nearly 10% from its late 2018 levels; but negatives around petrol prices (average pump prices nationally up 18¢/litre since early February) and continued declines in house prices. The month to month gain in sentiment was driven by a solid rise in expectations for the economy and family finances with some offsetting drag from weaker assessments around current finances and ‘time to buy a major household item’. The Budget appeared to shore up confidence around the economy, which has had a shaky start to the year with choppy reads in the previous three months. The ‘economic outlook, next 12 months’ sub-index rose 6.2% in April, regaining most of the ground lost in March. The ‘economic outlook, next five years’ sub-index also rose 5.9%, retracing all of the previous month’s decline. Both sub-indexes are again in net positive territory above 100 and well above long run averages. Consumer views on family finances were much more mixed. The ‘finances next 12 months’ sub-index posted a solid 4.1% lift, no doubt reflecting the tax measures at the centre of this year’s Budget. However, as discussed, the sub-index tracking assessments of ‘finances vs a year ago’ posted a sharp 4.9% decline in April to be down 9.6% on a year ago and at its lowest level since August 2017. Attitudes towards spending also cooled notably with the ‘time to buy a major household item’ sub-index declining 2.0% to 115.5 in April (despite a 10.5% post-Budget lift). While that is still a positive read, it is below the levels seen a year ago and well below the long run average of 127. The readings around both current finances and ‘time to buy a major item’ remain consistent with the weak consumer spending growth seen through the second half of 2018. Renewed confidence around the economy eased job loss fears a little in April. The Westpac-Melbourne Institute Unemployment Expectations Index recorded a 2.5% decline, retracing part of last month’s sharp 8.9% jump. Recall that lower readings indicate that fewer consumers expect unemployment to rise in the year ahead. At 127.4 the index is back below the long run average of 130”. Sentiment around housing improved in April. The ‘time to buy a dwelling’ index rose a further 2.4% to 119.4 in April, a four year high. The index has now risen 33% from its mid-2017 low and is back around its long run average of 120. Improving affordability continues to see a lift in buyer sentiment in NSW and Victoria although in both cases there is still some way to go before buyer sentiment returns to long run average levels. More surprisingly, the Westpac-Melbourne Institute Index of House Price Expectations posted a strong 11.9% rise to 95.6 in April, boosted by a sharp increase in New South Wales. The Index is coming off a March reading that was the lowest level since we began compiling this index in 2009. The Reserve Bank Board next meets on May 7. The Governor’s Statement following the April meeting saw a change in the wording of the key final paragraph. From our perspective, that change indicated a more flexible approach to interest rate policy than the ‘on hold’ stance we have seen since September 2016. The Board meeting in May will consider the staff’s revised growth forecasts for 2019 and 2020. We expect these to be markedly lower than when last reported in February with growth tracking around or below potential. In those circumstances it is reasonable to expect the Board to move to a more formal easing bias in preparation for the first rate cut, which we expect to be delivered in August. A nothing burger rise gone like rain on the mountainside.